Dramatic CCTV footage has been released of a woman's auto plunging seven stories off the side of a parking garage. The dramatic scene was captured on video released Thursday, Aug. 10, 2017, by Austin police. The video shows the BMW crash front-first into the pavement, before bouncing off the back of a Chevrolet Tahoe owned by William Burch. 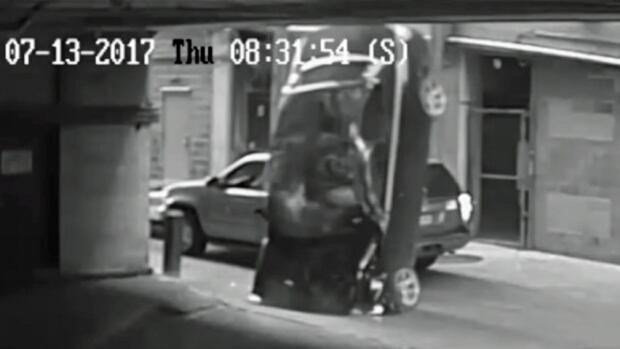 A screen grab from security camera footage shows the moment a BMW auto slams into the ground just missing an SUV after falling seven floors from a parking garage. The woman in the BMW was hospitalized, but police expect her to be okay. In September 2016, that same garage was cited by Austin officials over unsafe barrier cable systems. She suffered serious injuries. Burch, who had his window down, had just pulled a U-turn at the entrance of Littlefield Garage July 13 and was driving away when he suddenly heard a noise and braked, he told KXAN. 'So I just immediately just put it in drive and started driving forward and as I started driving forward, the vehicle landed on me'. Bizarrely, this is the second time in less than a year that a vehicle has fallen off the edge of the same parking garage. Bystanders reportedly helped the driver until paramedics arrived. The garage is now looking at redesigning its entire cable system.